198 pages | 8 Color Illus. | 30 B/W Illus. These in-depth, historical, and critical essays study the meaning of ornament, the role it played in the formation of modernism, and its theoretical importance between the mid-nineteenth century and the late twentieth century in England and Germany. Ranging from Owen Jones to Ernst Gombrich through Gottfried Semper, Alois Riegl, August Schmarsow, Wilhelm Worringer, Adolf Loos, Henry van de Velde, and Hermann Muthesius, the contributors show how artistic theories are deeply related to the art practice of their own times, and how ornament is imbued with historical and social meaning. "This emphasis on the chronological margins of Modernism should not come as a surprise either, since Modernism and ornament are two notions that are often positioned in diametrically opposed way. 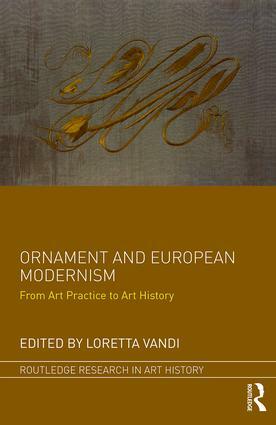 The famous, but not always well read or contextualized slogan of Alfred Loos, ‘Ornament is crime’, is the best-known symptom of this antagonism, which the interesting collection edited by art historian Loretta Vandi aims to question. And it does so very successfully, thanks to the rich and sophisticated historical reconstruction and close-reading of many debates, publications, and realizations having to do with ornaments." "[This book] offers an in-depth contribution to the theoretical interpretations of ornament and its role in the development of a crucial period in Western art and architecture. … While some of the essays provide a deep contextual analysis, others are more focused on the discussion of specific and complex theoretical issues, but all of them share a common concern about the question of the dissociation between non-representational and representation art and the problem of the unity of art." Loretta Vandi(Ph.D., Université de Lausanne, 1998) is Professor of Art History at the Scuola del Libro in Urbino. She has held four Samuel H. Kress fellowships. Her publications include La trasformazione del motivo dell'acanto dall'antichità al XV secolo (2002), Il Manoscritto Oliveriano 1 (2004), and Four Essays (2007).